Could we Model Our Retirement Spending like Endowment Funds? If you are planning for your retirement, you will approach your financial planner to help you plan how you can systematically spend down your wealth. In the past, I have written about planning for retirement (RET) or financial independence (FI), how much you need, how do you know if you are ready, and what are some ways to systematically spend down your wealth. I consolidated them in my Planning for Retirement section. We cannot remove the relationship between how much you need in RET/FI with how you systematically spend down your wealth, how much you need to set aside for the next generation. And thus some of the solutions that we suggested centers on a recently widely researched safe withdrawal rate called the 4% Safe Withdrawal Rate. The appeal for using this safe withdrawal rate in your planning is that it is very simple to find out if you are close to ready for retirement. For example, if your current spending is $33,000/yr, how much you need to accumulate is $33,000/0.04 = $825,000. If you are missing a couple of $100,000, it is rather motivating. Still, I think 4% is a very simple way to let you know how close you are from thinking about planning FI this seriously. As such, I have covered various ways people have thought of to systematically withdraw their wealth. We called these Systematic Withdrawal Plans (SWP). The idea is that your wealth is like your parent. They decide what is best for you. They want to be prudent, but also make sure you do not starve, not run out of money. Today, we are going to add a different perspective to the discussion. We are going to explore if we can incorporate some of the SWP rules of Endowment Funds. Endowment funds and foundations are your universities, charity foundations. They have a specific requirement to provide cash flow to the university and foundations but also to ensure they do not run out of money. Thus compare to endowment, the requirements are pretty similar. So let us see what we can come up with. Depending on the endowment, some may prioritize spending needs over preservation of wealth, while for others their priority is the opposite. You realize, that is how a lot of people live their FI lives as well. Somehow I realize my concept of the Wealth Machine is somewhat about endowment funds. What I do understand from a lot of people is that, they wish to keep their money infinite. And thus their idea is only to spend the dividend and interest income, and at most the capital gains only. The income and capital gains, make up the total returns of your financial assets. If their dividend income and capital gains fluctuate, your spending is going to be volatile. And they might not keep up with inflation. Thus, there are virtues of spending a percentage of your wealth rather than only spending the income and capital gains. 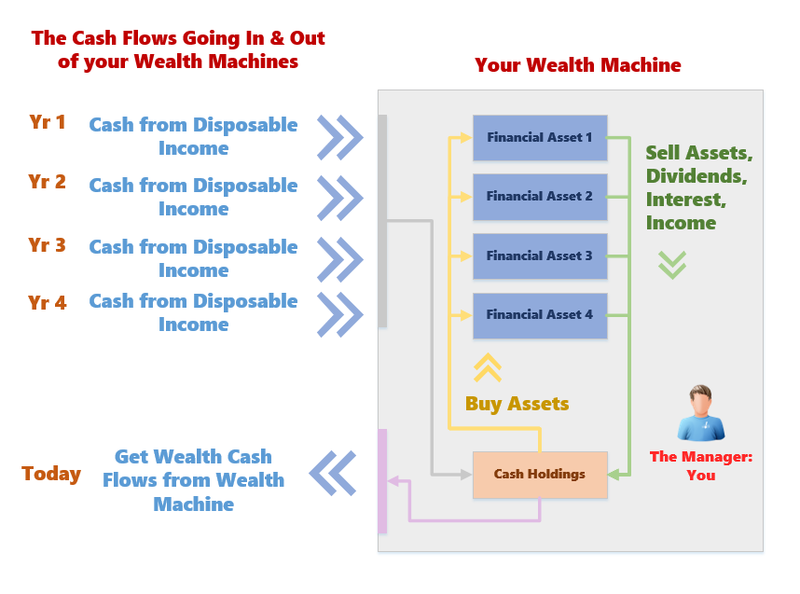 Your wealth machine can be model as an endowment where, depending the phase of life, and the scheme you live, you would choose to take wealth cash flow distribution. At different phase, you might still have income coming from disposable income. There can be at times larger wealth cash flow distributions, and that could deplete the machine. Thus someone needs to keep a tight watch on things. You wish to prolong it such that, any amount you do not use, the next generation can make use of it. Endowments do have some unique spending characteristics that are similar to us: Periodic Predictable Large Spending. What make Good Rules for Spending? I learn this from some actuary blogger that this is more of a Sustainable Spending Plan. I guess the difference is that spending takes the center stage. In a lot of the 4% withdrawal rate or variable withdrawal strategies, we are developing a Systematic Withdrawal Plan. In this, preserving long term spending and wealth assets take center stage. With that, here are some spending rules that endowment funds would made use of. I think this is the starting point for a lot of endowment plans. It is one of the variable withdrawal strategies in my variable withdrawal strategies article. 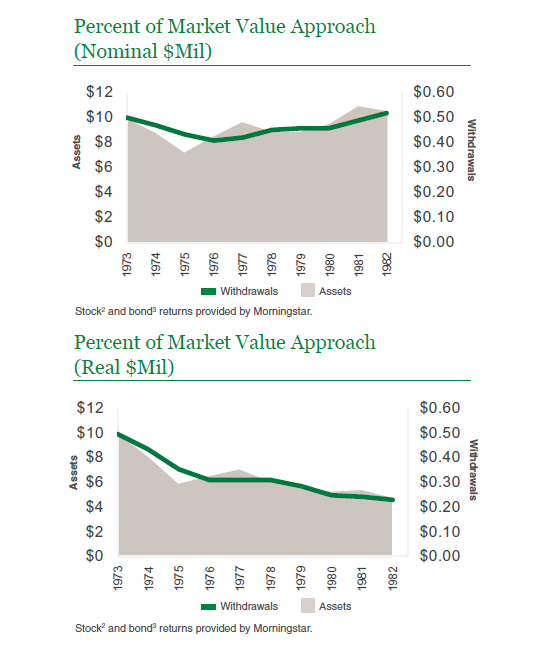 The endowment will spend a agreed upon percentage of previous year-end market value. It would seem endowment funds use 5%. So if you are modelling this strategy, if last year your portfolio is $483,500, for this year, you can spend 483500 x 0.05 = $24,175. The strength about this strategy is that you will not run out of money since it is always 5%. The weak point is that, if the value of your wealth machine fluctuates, your spending will fluctuate. To the point that it might not make sense. The counter point to this is that, it depends on what you invest in. This one builds upon the constant percentage withdrawal. Instead of taking last year’s wealth machine’s value, we take an average of past x number of years. This could typically be 3 years but I do understand endowments like to use 10 years. Sometimes they will set a floor and ceiling percentage. Since last years spending is $24,175, which falls within the 7% boundary, the permitted spending is $24,175. What we have is a smoothed out spending. It also tried to preserve the spending power. This seem to be similar to the safe withdrawal rate. The endowment take 5% of the endowment value in the initial year. Then for subsequent years, the spending is adjusted for either the inflation that year, or a given inflation rate. The upside of this is that at least the purchasing power is preserved. Like the safe withdrawal rate, you may deplete your money if the initial percentage is not conservative. It basically combines the average market value approach and the inflation adjusted approach. At this point, it seems this is not much different from my variable withdrawal strategies. However, Let us take a look at some research how this fared in a 20 year period with 2 bear markets. The research shows us the withdrawal rates for a $10 mil portfolio over the 20 years. This period saw some great capital growth but also 2 very drastic market downturn. One of them lasts 3 years while the other last 1 year but just as brutal. The inflation during this period is rather low. The first thing we noticed is that all three survived relatively well. Assets value go up from $10 mil to $17 mil at the peak of 2000, then drop to $12-13 mil at the end of 2003. In terms of spending, inflation adjusted approach gives you the greatest spending. No surprises there as rain or shine, this rule preserve your purchasing power. 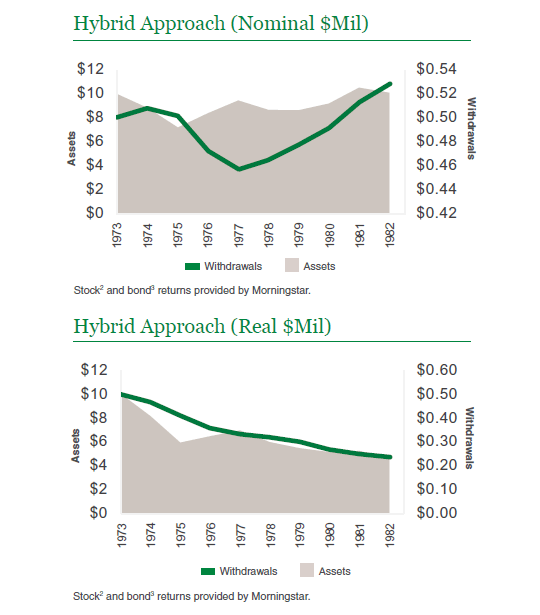 There is not much difference between the average market value and the hybrid approach. The researchers decide to throw these 3 rules against a pretty challenging period. The 1973 to 1982 period is littered with draw down and recovery, not to mention high inflation rate. If you want to see if your strategy lasts, this is probably one back test to do. The 2 chart above shows the nominal and real (neutralizing your purchasing power) withdrawals and asset value of this approach. What is interesting is that for this regime of the markets, their withdrawal rates look very consistent. It does look like they are balancing their budgetary spending versus capital preservation versus generating stable returns very well. David Swensen was the one who pioneered allocating towards more alternative asset classes such as private equity, venture capital funds, timber. This is in contrast to a 60/40 portfolio. 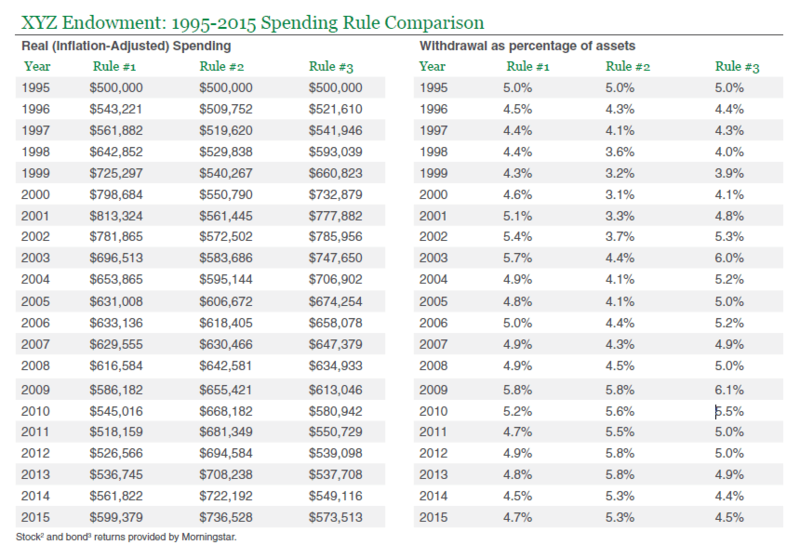 In fact Warren Buffett in his recent newsletter, chided these endowment funds for likely paying excessive management fees rather than adopting a simpler approach. I guess the goal is different for these endowment funds. They really need the low correlations between asset classes such that the overall portfolio volatility is much lower. 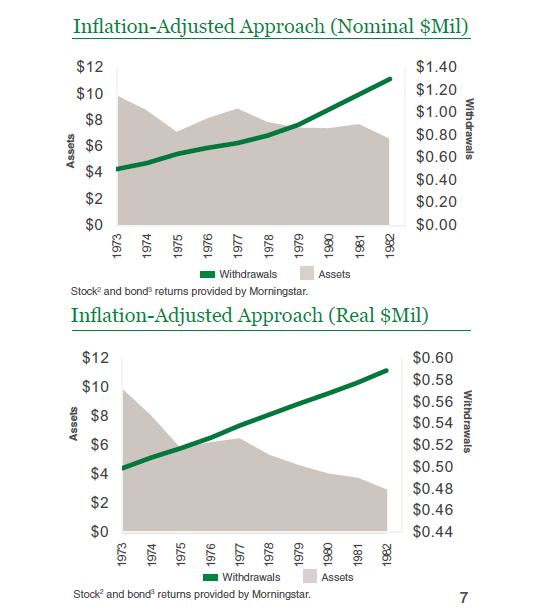 I looked at what Vanguard recommends institutions. And I look at the problems that people think about these institution withdrawal strategies and they do not seem very different from the dark arts of retirement planning. The most prevalent is the smoothed moving average of a percentage of market value. The recommendation to get it better is to apply a floor and ceiling percentage, or inflation indexed it, or a mixture of the above. And experts are questioning whether in a different environment, would the 5% constant percentage withdrawal rate is too dangerous. When we contrast this to the dark arts of FI planning, its the same. You can have a constant percentage of assets, floor and ceiling, or a combination. And the downside are the same, which is you do not keep up with inflation and lose purchasing power. In our personal retirement, the experts are wondering if the old 4% rate is too optimistic. What is recommended in a lot of the advice to endowment managers seem to be to be flexible. And to be flexible can mean a lot of things. I read this as to be flexible in your spending. Your spending is often tied to what are the “proposals” that are put in front of you. There are projects that, from the long term basis, is worth sacrificing, despite the markets not doing very well. There are projects that could be delayed until the finances stabilized. In your retirement, this is applicable as well. The other thing that you need to be flexible is to anticipate the changing regimes. There are a lot to be said about how poor active management have under perform their benchmarks. However, I wonder if our goal here is to under perform or to preserve our spending power. If it is to do that, then anticipating a shift in the regime and a shift in asset allocation to one that preserve purchasing power might be more appropriate. Hi Bigboiboi, thanks for that. I sort of remember that but it would entail 2 different portfolio. basically a low vol portfolio made up of dividends, interest and other income, and a portfolio made from spending half of the long term real returns. 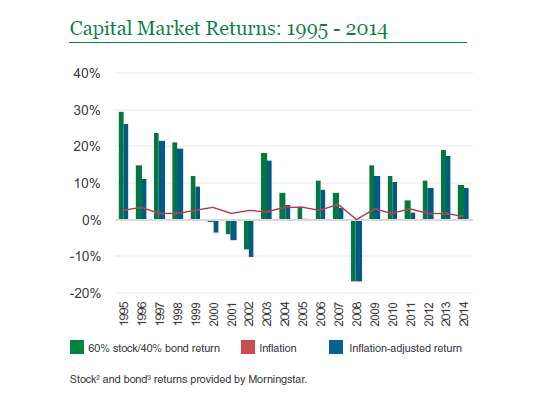 I wonder how much the real returns is over time. This article looks like it is adapted, expunging and pasting from American literatures. Any retirement and financial subjects in Singapore that do not incorporate CPF and HDB structures, are just that; idle banters.